Shah Alam, Malaysia, January 17: Team Europe romped to an emphatic 18½ to 5½ victory over Asia to secure their first win at the EurAsia Cup presented by DRB-HICOM on Sunday. Match play expert Ian Poulter once again set the tone for Europe by beating Malaysia’s Danny Chia 4 & 3 in the top singles match to put some early blue scores on the board and quell any hope of an Asian fightback at Glenmarie Golf and Country Club. The English duo of Lee Westwood and Andy Sullivan followed up on Poulter’s lead by beating Nicholas Fung 7 & 6 and Thongchai Jaidee 4 & 3 respectively before leaving it to compatriot Danny Willett to deliver the final blow to Team Asia’s hopes. Willett’s 3 & 1 defeat of Byeonghun An ensured Team Europe would become the first side to lift the EurAsia Cup after the inaugural event in 2014 ended in a thrilling 10-10 draw. Team Asia’s points came courtesy of India’s Anirban Lahiri and Korea’s K.T. Kim, who beat Shane Lowry 2 & 1 and Bernd Wiesberger 3 & 2 respectively, whilst a birdie putt on the last hole by young Jeunghun Wang ensured his match with Ross Fisher would finish in a tie. Clarke, who will also captain Europe's Ryder Cup team in September, was delighted with his team’s emphatic victory. They won the fourball and foursomes sessions 4 ½ to 1 ½ on both days before winning nine singles matches and halving one out of the 12 on the final day. "The team have played fantastic this week. There have been a lot of positives. I've learnt a few things, and hopefully I'll do a better job come September,” said Clarke. Captain’s pick Poulter delivered three points for Europe from as many matches, handing Chia his only defeat in the EurAsia Cup by shooting six birdies through 15 holes. “Danny had nothing to lose so I had to come out and play strong, and that’s what I did today. I played pretty solid, holed some decent putts and obviously made it very difficult for him,” said Poulter, Europe’s talisman in the Ryder Cup. Willett, who finished second in the Race to Dubai on the European Tour last season, was delighted to secure the win that gave Europe the unassailable lead over Asia, who never found their putting touch on the greens all week. “It’s been a fantastic week and a fantastic group of lads. We've had a good laugh, and I think to enjoy it, we've really shown Europe's true colors and European spirit and a pretty outstanding win,” said Willett. Team Asia’s captain Jeev Milkha Singh of India conceded Europe were worthy winners of the EurAsia Cup but vowed to come back stronger in the next edition of the match play event in Malaysia in 2018. “I still feel that the team was really strong, and I think they still need to keep their chin up and believe in themselves that they are the world beaters and they are going to do really well and I wish them all the success. But the experience we have gained from this, that's what we take away from here and nothing else,” said Singh. Thongchai, who was the playing captain for Asia two years ago, said Asia would bounce back in two years’ time. “Our team tried so hard. Even Jeev, he is a very good captain. But Europe had a very strong team. “I didn't play well this week and I think we try to make up in two years, we have to plan early. That's the key thing. We’ll look forward to 2018 and I think we have more experience next time and have a good chance to try to beat the European Team,” said the Thai veteran star. I was a volunteer for the 4 days of the Maybank Championship (MC) held at Saujana Golf Resort, Kuala Lumpur between 1-4 Feb2018. There were over 250 volunteers supporting the event in various roles : scoring, static and walking marshals, TV, scoring etc. 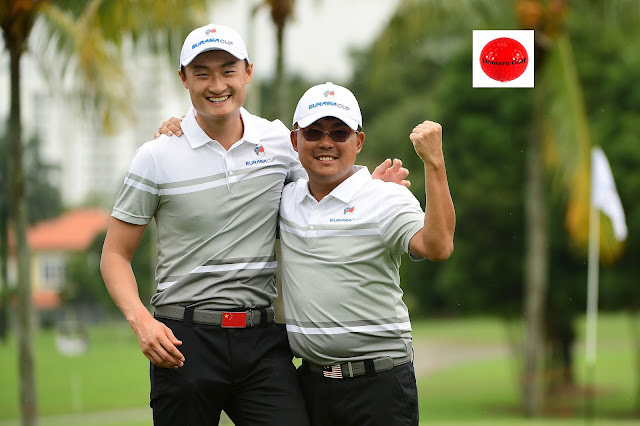 There is a core of volunteers who have been participating for 6 or 7 years at the three annual main professional events held in KL - this Maybank Champonship, Sime Darby LPGA and CIMB Classic PGA and the biannual EurAsia Cup. So it is like being part of a big family of Malaysians of all races and a few long term expats - British, French, Aussie, American etc. There is good comradeship and cooperation. Our reward for volunteering is breakfast and lunch, tournament shirt and hat, umbrella and volunteers golf game (for those who attended all four days) the following week. PAUL SYMES: Thanks for joining us. Ross, you've obviously played in The Ryder Cup before, got a wealth of experience in match play. Looking forward to the responsibility of maybe taking Kristoffer under your wing a little bit in fourballs? ROSS FISHER: Yeah, definitely. I obviously have a little bit more experience than Kristoffer, but I think we're just going to go out there and have some fun. He's playing well, won a Final Series event last year, so it's a good, solid pairing, so hopefully we can gel well together and make as many birdies as we can. PAUL SYMES: Ian, important to get off to a fast start and get an early point on the board?